Q: I ran into a pole in a parking lot and dented the edge of my door. I left it alone and now it is starting to rust. I have insurance coverage, but I don’t want to spend a lot to get this fixed, so will a body shop simply treat the rust and leave the dent? A: Although you could probably find some shop that will treat the rust and leave your dent, the reality is most body shops will want to fix the whole damage. There are several reasons for this. First if you are using your insurance company to pay the damages, even though you were at fault in this case, this repair would fall under your collision policy and all you would be out is the price of the deductible, or the price of the repair, whichever is less. Your insurance company is going to pay to have the repair completely done, not half-done. This is their policy to return your vehicle to a pre-loss condition and it is the right thing to do. Painting over rust in a dent is not going to fix anything log term for you. Any auto body shop assessing minor damage like this can write a very accurate repair estimate, as this is mostly a visual inspection. Where the estimates become less accurate are for heavy hits like those from major collisions. If price is still a big issue, while you getting your estimate, you could ask the body shop if there are any other alternatives to reduce the cost of the repair to you. For example if there is a local pick-a-part salvage yard with a suitable replacement panel available, your body shop might offer to simply paint the new part and allow you to swap it out yourself. Some things such as hoods bumpers fenders and even doors can be accomplished with a few mechanical tools and average mechanical ability. This will require some time and some sweat on your part, but a body shop looking to gain a happy customer might just help you out. 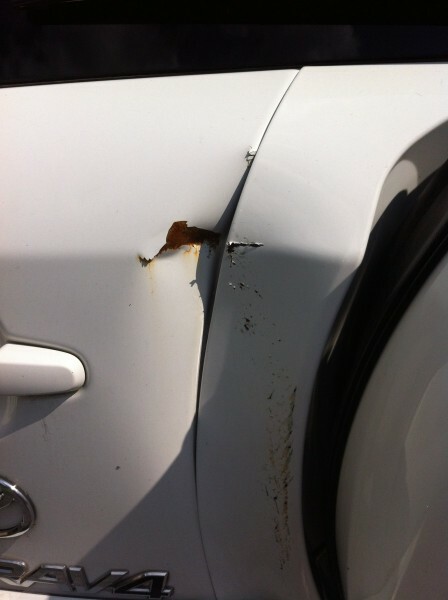 No auto body shop will simply paint over rust or a dent and call it a day. Every car that comes out of an auto body shop is the calling card for the next guy needing repair. We ALL buy auto body services based on quality of the work preformed regardless of how we hear about it. I can’t think of one single professional auto body shop that would offer to simple spray a little paint over the damage. If this is your true desire, you can accomplish the same results with a little bottle of touch up in a can and some sand paper. Some auto body shops that are going through a slow period might offer to cut a deal with you to repair the damage outside of your insurance. Lets say you have a $500 dollar deductible and the repair comes in at $750. If a shop is slow they might offer to do the repair for $500 or less if you pay them directly. This way you are not out any more than you would be with your deductible, plus you save the risk of having a claim on your insurance history. The benefit to the shop is a quick turn repair job even if it is at break even just to keep the shop busy. Body shops are paying their staff whether they are repairing cars or not, so your small parking lot damage might be a good fit for a slow time. So if you are flexible about when the repair happens, you might consider negotiating the rate. So again to answer the question, no body shop will simply paint over a rusty ding, dent or crease no matter how minor the damage. But you might be surprised at how a little negotiation on your part could cut your repair bill.